Proposals announced yesterday to boost the financial sector have been welcomed by industry watchers. The measures, which followed the Committee on the Future Economy recommendations, were wide-ranging, including strengthening financing for companies of all sizes with strong growth potential and building technology infrastructure. 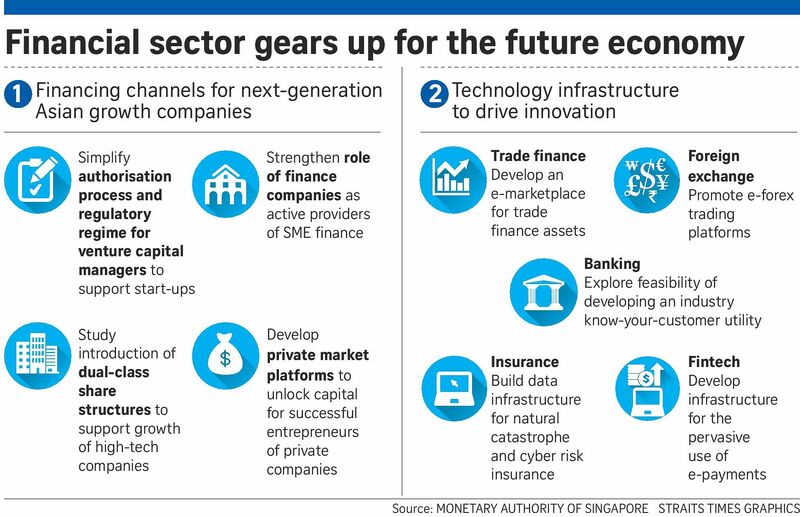 Venture capital firms said the proposals, which were announced by the Monetary Authority of Singapore (MAS), would boost the vibrancy of the fast-evolving financial sector, including new areas such as fintech and e-payments. "Singapore's start-up economy is searching for its own inflection point to take off and can do this only with evolved, calculated government support," said Mr James Bitanga, chief legal officer of venture capital firm Reapra. He highlighted that the recommendations on new financing policies, such as studying private market financing platforms in other economies, would bolster the private finance ecosystem. Mr Justin Hall, principal at venture capital firm Golden Gate Ventures, noted that MAS said it would simplify regulatory requirements for venture capital managers, which will "go a long way in helping facilitate the formation of new capital in Singapore". He welcomed news that MAS was looking at ways to boost the use of e-payments. Part of MAS' drive to boost the use of e-payments includes the introduction of the Central Addressing Scheme (CAS), which will be implemented in the third quarter. It lets users make fund transfers using proxies, such as mobile numbers and NRIC numbers, instead of bank account numbers. A spokesman for DBS, which is part of the CAS task force, said CAS is an important infrastructure that will let banks develop better payment applications for customers. Mr Leow Tze Wen, chairman of EQ Insurance, said measures to build data infrastructure for natural catastrophe and cyber risk insurance was a step in the right direction, as insurers need such information to price and offer such a product. "If the data collection is readily accessible and the data is reliable, it will help insurers here price the product, and will grow cyber risk insurance in Singapore," he added.